On Saturday, I was on a mission to go berry picking. Either blueberry or raspberry would do. If you are a fruit-picking and farm fanatic like I am, you might want to check out this map. It’s the Massachusetts Agricultural Tourism Map put out by Massgrown. It’s a pretty stellar resource. Using the map, I located Parlee’s Farm in Chelmsford, a 40 minute drive from Cambridge. We ended up picking several quarts of blueberries in less than an hour. Another reason I chose Parlee’s was its proximity to one of the Kimball Farms locations. 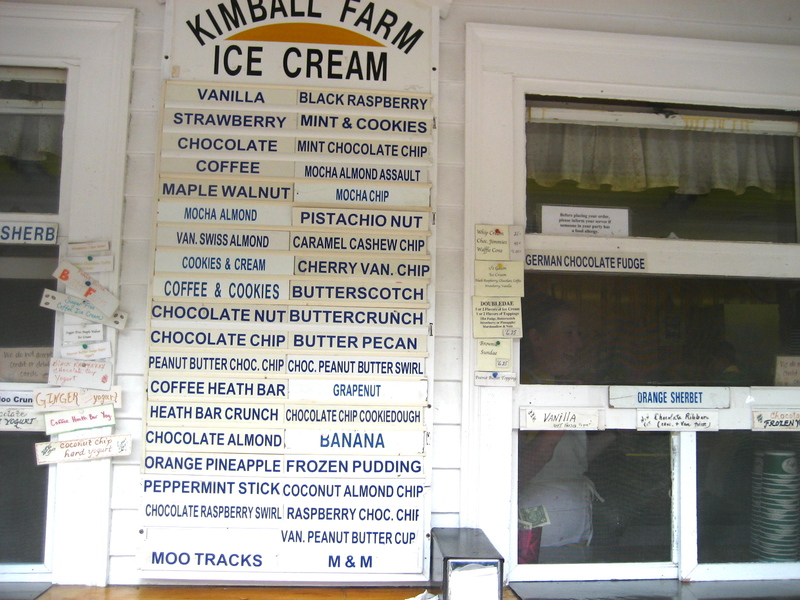 I have been reading about Kimball Farms for some time now, the Massachusetts ice cream maker famous for their mammoth portions. 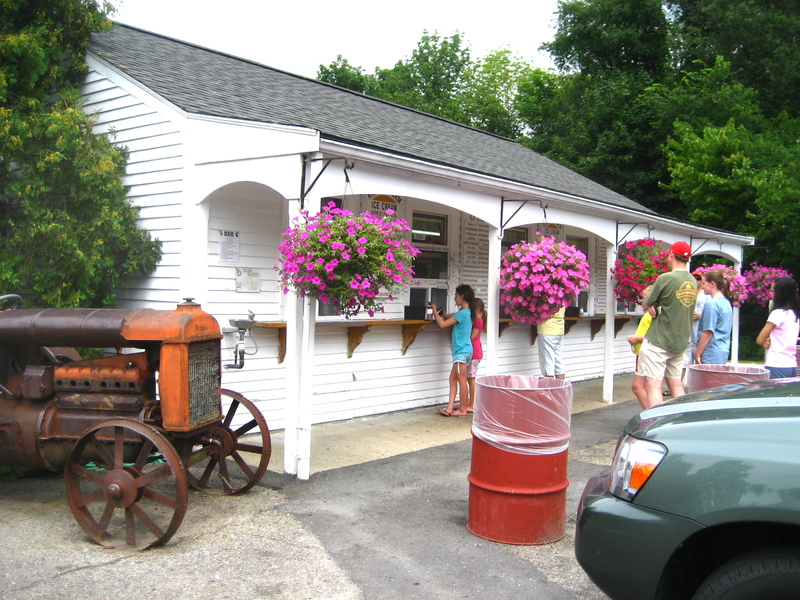 They were also voted best ice cream stand in Massachusetts in 2010 by USA Today. I was giddy as soon as we stepped onto the property. Bright pink flowers and a charming old-fashioned tractor adorned the white ice cream building. On either side of the building are several picnic tables, perfect for setting up shop with your ice cream. Choosing your flavor of ice cream won’t be easy. 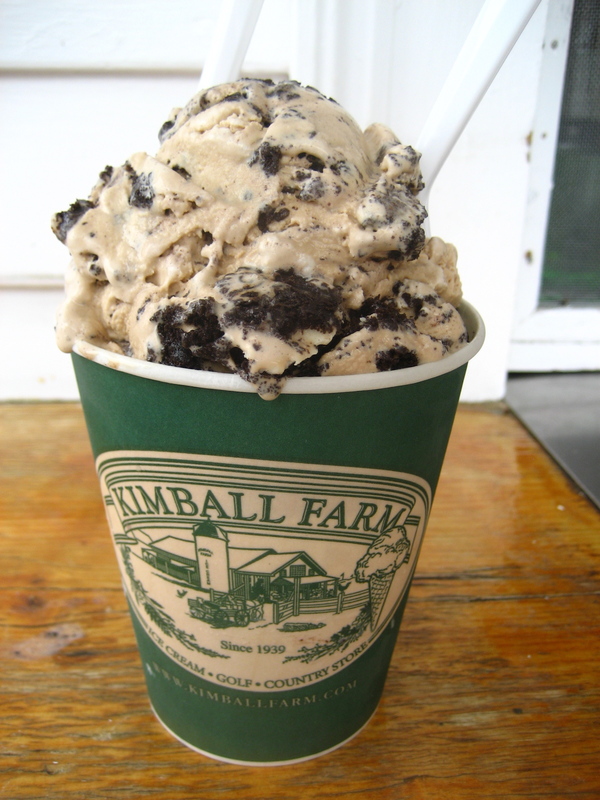 Kimball Farms boasts over 50 flavors, both old favorites and some more unusual: caramel cashew chip, ginger, orange pineapple, mocha almond assault, german chocolate cake, coffee heath bar, vanilla peanut butter cup and more. Before making our decision we tried a few flavors. Two standout ones were chocolate chocolate truffle and grapenut. The first had an ice cream base that actually tasted like the ganache of a chocolate truffle, rich and chocolatey, with large chunks of chopped truffle mixed in. The grapenut had a delightful sweet cream base packed with softened, chewy grapenuts. We ultimately decided on a large with two flavors: coffee oreo and butterscotch. One downside: they technically don’t allow two flavors in a small, so if you want two flavors, like I always do, prepare for massive amounts of ice cream. To give you an idea, our cup was larger than a pint container of ice cream, with ice cream piled above the top. Two of us could not finish it, we came close, but that was too much ice cream even for me in one sitting. The ice cream came to us already slightly melted around the edges, which I love. The coffee oreo had a lightly sweet base with lots of huge oreo chunks. The butterscotch underneath had a thick, buttery consistency, sweet and a little salty. You might recognize this combination from when I tried out Captain Dusty’s. The sweet, rich butterscotch plays off the bolder coffee flavor beautifully. Going to Kimball makes me want to press a button and stop time so that summer will last forever. I plan to go back multiple times to check a few more flavors off my list. The grounds are beautiful and you can easily while away an hour or two there, which is a good thing and as that’s just how long it might take you to actually finish your ice cream. 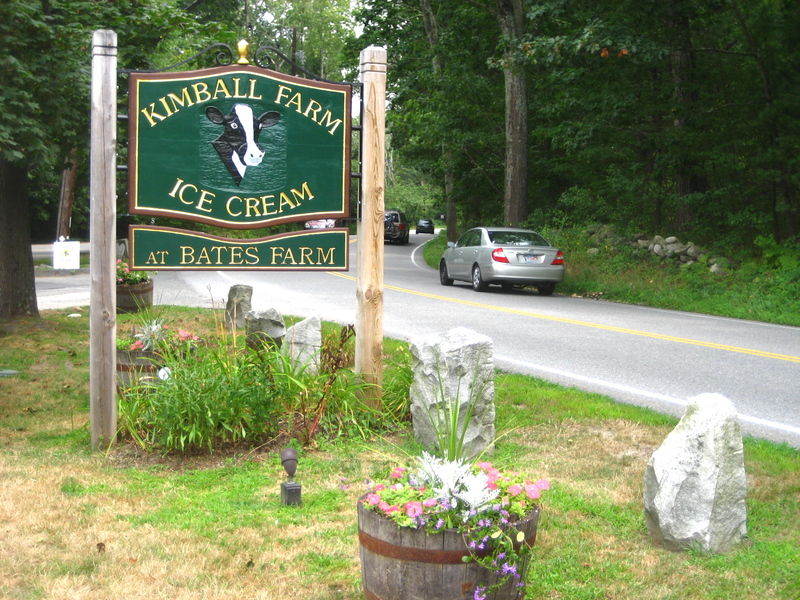 This entry was posted in Reviews, Travels and tagged Farms, Ice cream, massachusetts. Bookmark the permalink. You really do live the life! Those Oreo chunks are awesome! A lovely elegy to ice cream! And what a fantastic map. Um, you were pretty close to me! Can we meet somewhere for an ice cream stand date? How about Richardson’s? Yes I would love to!! It’s so funny I was actually looking at the map afterwards and noticed that it is close to both Andover AND Tewksbury. There are so many cool ice cream stands I want to try. Richardson’s and also Bedford Farms. Let’s plan it! You worked at Kimballs?? That’s awesome. One of the things I didn’t mention, now that I think about it, was that the staff were SO friendly. Coffee Oreo is a favorite ice cream flavor of mine, I thought that’s what the first pic was before I even read the post. sounds like a great area to explore! yes please, save summer and bring me ice cream 🙂 i need to get there soon… i’m drooling! I would definitely go with coffee oreo and do my best to make a big dent in it! Wow, that really is a mammoth proportion! Looks delicious though! Yum I love Kimball’s too! I usually go once a year, usually after apple picking. They have a fun mini golf course to! Yum I love Kimball’s too! I usually go once a year after apple picking. They have a fun mini golf course too! Oh I wish that they sold that ice cream here in Tennessee! It looks so delicious and what awesome flavors! Ice cream is my favorite part about summer, too. Love the look of this place! I worked at the Westford Kimballs too – with Fiona! Excellent choices! 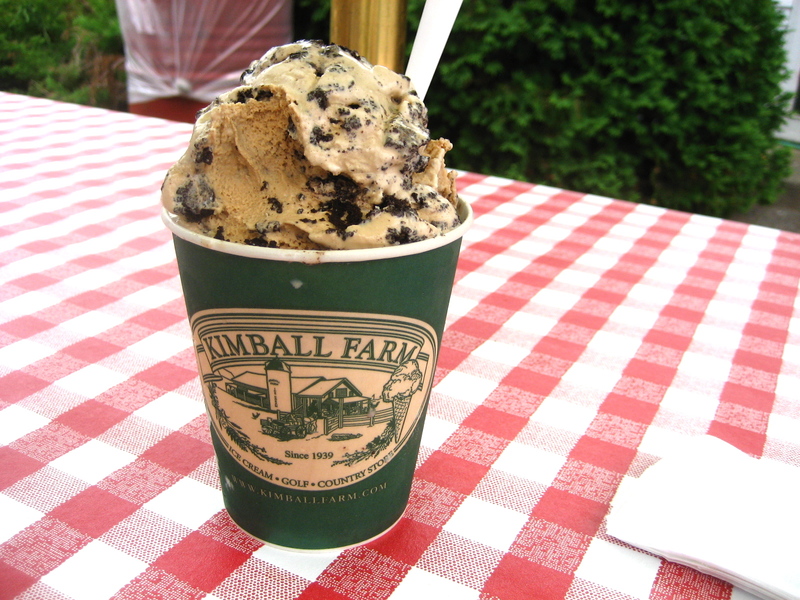 When that cup showed up in my Google reader I realized it has been way too long since I’ve had Kimballs ice cream….yum. To tell you the truth, I think I saw that Oreo Blizzard before from Dairy Queen that they are “so-called” celebrating the 100 year anniversery. I can just order a large Oreo Cookies and Cream here and have something that’s a hundred times better. And by the way, I ordered a nice-sized banana split with Oreo, Mint Oreo, and Coffee Oreo for my 100th year celebration. I am a huge fan of Kimballs Carlisle.